Easy and Fast x264 .MKV to PS3 and Xbox 360 compatible MP4 conversion. A powerful, easy to use MP4 video conversion tool. PiMPStreamer is a realtime video/audio streamer from your PC to your PSP (Playstation Portable). Any format/size avi/mpeg/wmv/etc can be streamed without any delay. PS3 Media Server is a DLNA compliant Upnp Media Server for the PS3, written in Java, with the purpose of streaming or transcoding any kind of media files, with minimum configuration. It's backed up with the powerful Mplayer/FFmpeg packages. 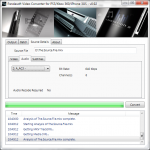 PS3 Video 9 is a free video conversion application developed by Red Kawa. It allows you to convert your computer video files (like avi, divx, mpeg, etc.) into the specific video formats that are playable on the PlayStation 3. PSP Video Converter for Playstation Portable is a FREE compact GUI tool driven by FFmpeg and AviSynth roaring under the hood. Serviio is a free DLNA compatible media server. It allows you to stream your media files (music, video or images) to any DLNA-certified renderer device (e.g. a TV set, games console) on your home network. The TVersity Media Server lets you manage your Internet and home media and create your personalized lineup of channels and serves this media to a multitude of networked devices in the home or on the go.